VW is launching a digital sales offensive, with a new Web site, shown, in North America first because "the U.S. is leading globally in matters relating to the Internet," marketing boss Luca De Meo says. HAMBURG -- Volkswagen has launched a digital sales offensive in the United States that will roll out to the company's other key sales markets. With its new interactive vehicle configurator, VW is reacting to the growing importance of the Internet and automobile purchases. 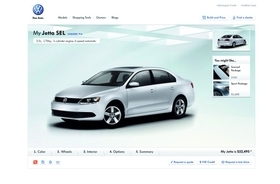 VW says the configurator is the core of a new digital sales strategy. It says the configurator presents each vehicle in "3-D and HD quality, realistic enough to touch." VW has also installed a function called "social shopping." "If a specific feature is selected with the configurator, other feature combinations that are the most popular with other customers appear," a VW spokesman said. "According to studies, these kinds of purchase recommendations are highly relevant to individual purchase decisions." Furthermore, arranging a test drive is designed to be less complicated than it is now. "The configurator asks the user for his location and conveys a suitable selection of dealers with Google Maps technology," VW said. A digital customer center, Volkswagen World, is being introduced as a third building block of the strategy. "Here the vehicle owners receive additional information on the functions in their vehicle, such as tips on operating the radio, navigation systems or cruise control," VW said. Christian Klingler, VW Group's sales chief, said: "We want to offer our customers a comprehensive brand experience and make the purchase of an automobile as easy as possible. An attractive Internet offering is indeed part of that." VW said all the new features are iPad compatible. VW CEO Martin Winterkorn wants to build VW into the world's biggest automaker and topple Japanese rival Toyota Motor Corp. from the industry's pinnacle. 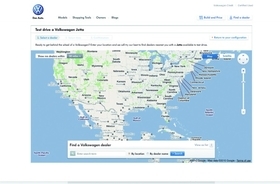 VW's online sales configurator uses Google Maps technology. Luca De Meo, VW Group marketing manager, explained why the United States was chosen to get the online configurator first. "The U.S. is leading globally in matters relating to the Internet," he said. "So we are deliberately beginning our digital sales offensive in this market. "We will use the experience that we gained in the process in the further international rollout of the initiative. To me, it's a beautiful example of how the global Volkswagen brand exploits its worldwide expertise purposefully and intelligently." In a recent interview with Automobilwoche, De Meo laid out important clues to the cornerstones of VW's digital sales offensive. "We have to gear ourselves to the fact that customers are asking for online services. We know that 90 percent of all people looking for new product go onto the Internet first to find information. Just four years ago it was only 60 percent. "In the U.S., many car customers have long driven to the dealer of their choice, and then used their smart phones to get more information on the vehicles displayed in the showroom. We have to gear ourselves to that, and fast."